With 3 Ravens and Mash Brewing having been through a process of consciously uncoupling, there's been an opportunity for the former to launch its own line of Berliner Weisse style beers. 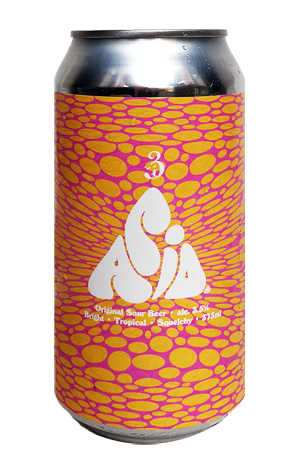 Previously, Ravens head brewer Brendan O'Sullivan's passion for such beers was satisfied via the Wizz Fizz range under the Mash banner; now, it's time for a new collection going under the simple title: "ACID". This first release comes unadorned, free from any fruit or other additions we expect to see down the line, looking like a hazy pale witibier and built from the brewery's increasing complex mixture of souring and fermentation cultures plus "generous whirlpool hopping". It's designed with festivals, the beach and BBQs in mind, offering Juicy Fruit gum, some rounding sweetness and a sherbety liveliness thanks to its soft acid underbelly. Look out for more experimental takes in the future; for now, rest assured this isn't the brown acid.